Let's give DC a big round of applause for getting this figure into stores on April Fool's Day. 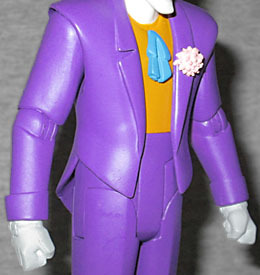 It's not only appropriate because this is the Joker, though that would be reason enough - no, what really makes it special is that the figure is based on a specific Batman: the Animated Series episode, "The Last Laugh," which (as revealed by the bundle of newspapers being delivered at the start of the episode, and by Alfred's terrible "dad joke" effort at pranking Bruce) took place on April 1! Joker was voiced by Mark Hamill, a role which really revitalized his popularity, if not his career. If not for BtAS, would we all be talking about how great he was voicing Hobgoblin in the Spider-Man cartoon? As Gargoyle in The Incredible Hulk? Do you think the Wing Commander games would have (re-)propelled him to stardom? And yet he was the second choice: originally they wanted Tim Curry, possibly because he had experience playing clowns. They only gave Hamill a chance at Joker because he'd already voiced Ferris Boyle in Mr. Freeze's origin story. Joker was sculpted by Irene Matar, who also did Series 1's Batman and Catwoman. We have to say, though, that the head does not look quite right: compared to the correct design, the chin is too long and pointy, and the eyes are much too small (to say nothing of being white, rather than yellow). There were definitely times when Joker looked like this on the cartoon, but those were times when the art was off-model - not something to be emulated. On top of that (or, technically, "below" that), his suit looks too smooth and undetailed. Remember, this figure is based on the first BtAS designs, not the later, streamlined designs; he should be more wrinkled. While he was usually drawn with an angled line across his waist, as though his orange shirt was a vest, "The Last Laugh" definitely showed him with just a straight line there, so that's what this toy does, as well. Same goes for the collar, which doesn't have any details other than a curving line. What is he, wearing a T-shirt? The tails on his jacket should be longer, too, reaching nearly to his knees instead of just his hips. After all the breakage issues DCD had with the first series of Batman: the Animated Series, they announced they were making a concerted effort to improve. And Joker proves that their efforts have not been in vain: he moves at the neck, shoulders, elbows, wrists, waist, hips, knees, and ankles, and every joint moved perfectly without sticking, without breaking, without shearing, and without needing to be frozen or boiled first. He moves like an action figure is supposed to move, and that's reassuring. The ankles are just swivels, with no hinge - that's a weird choice, and limits how much you can really do with him. 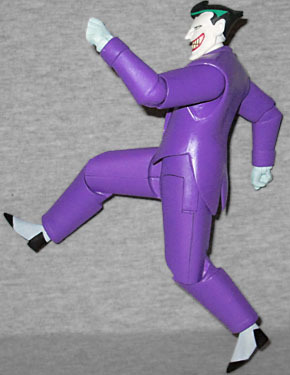 Like all the other figures in this line, Joker comes with a doll stand to help keep him upright if you do decide you want to see him in a wild, zany pose. After all, if the ankles aren't going to do you any favors, they might as well throw in something to keep him from perpetually falling to the ground, right? 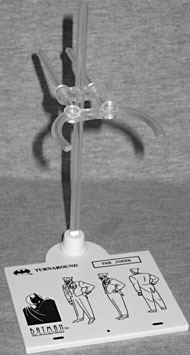 The base is printed with the model sheet turnarounds of the character (thus allowing you to easily identify which base goes with which toy, but also showing how far away from right his face is), and the clear plastic arm not only moves up and down on the post, the clamp is also designed to be positioned as far forward or back as you like. 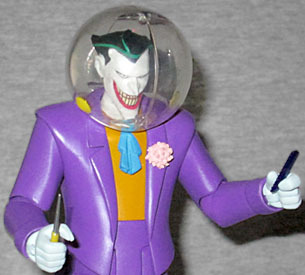 When these figures were solicited, Joker was announced as coming with a helmet, makeup sponge, knife, necklace, telescope, Joker card, brick, comb, and a cologne bottle. About half of those got cut before the final release, though: he does not come with a sponge, a card, a brick, or cologne. 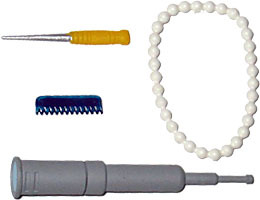 That does leave us with a translucent blue comb, a silver shiv with a yellow handle, a pearl necklace, a gray telescope, and a clear helmet with two yellow dots on it (those are supposed to be air filters, but on this toy, they're just solid dots). In the episode, the helmet usually looked more oblong, but here it's spherical. He also has three sets of hands: fists, pinching, and gripping. The gripping hands are perfect for the knife, and the pinching hands work for the comb, but it really does make us wish he had a joker card - even if it was a permanently molded part of his hand, like Two-Face or the JLU Joker. Guess we'll just have to do what we did with Bullseye, and make one ourselves. This is a good Animated Joker, but there's still a lot of room to make a better one. Even just giving him a more appropriate head would make a huge difference. So much as it pains us to say, maybe skip this one? Wait for the inevitable "New Adventures" version, or hope that DC releases an updated take on this one in a two-pack or something? You won't be terribly disappointed if you get this Joker, but he's not as good as he should be.